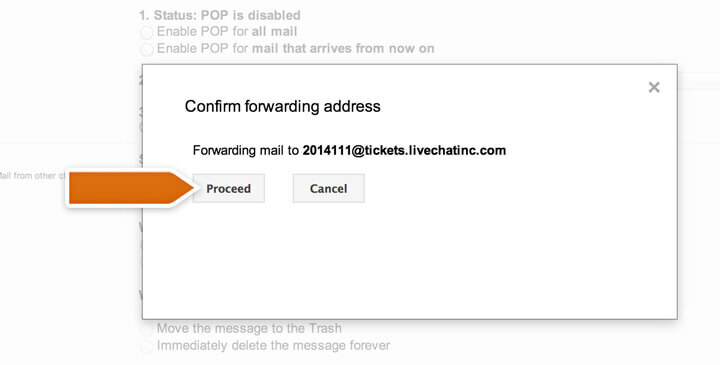 You can setup email forwarding to create tickets in LiveChat. Do it up to keep your entire support communication in one place. Log in and go to the Email section. Enter your support email and name that will show up as the sender of your tickets and click on the Save changes button. Copy the email address assigned to your account. Go to Gmail forwarding settings and click on Add a forwarding address to proceed. Enter the copied email and click on Next. Then confirm by clicking on Proceed button. A confirmation email should appear as a ticket in your LiveChat. Confirm the forwarding to finalize the setup. Starting now, all emails from this account will be forwarded to your LiveChat as tickets. Login to your Yahoo account and select Mail options from the Options menu. Choose POP & Forwarding option. Next, pick Set up or edit POP & Forwarding. Login to LiveChat and go to the Email section. Copy the email address assigned to your account and enter it in Yahoo! Forwarding options. Click on the Save button at the bottom of Set up or edit POP & Forwarding page to finalize the setup. Congratulations! From now on, emails sent to this Yahoo! account will be forwarded as tickets to LiveChat. Create a new contact in Active Directory and name it LiveChat tickets. In the second step, copy the email address assigned to your account and add it to the newly created contact. Access properties of the newly created contact and enable forwarding on the email address you use for support, e.g. support@company.com. 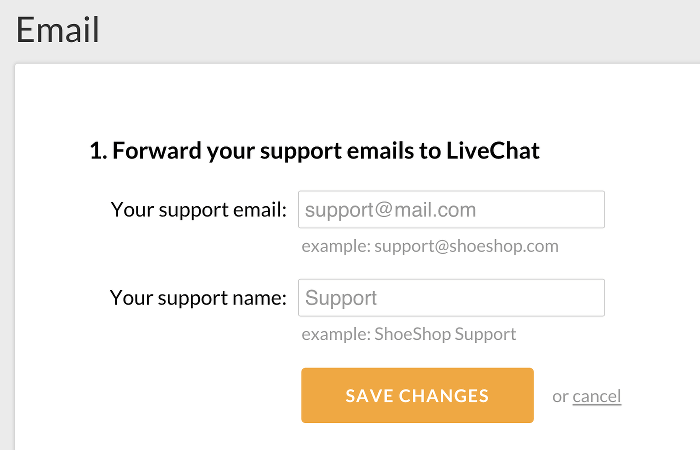 From now on, all your support emails will be automatically forwarded as tickets to LiveChat. You can setup forwarding for other email providers too. If you are using another system to handle your emails, you just need to create a forwarding rule that will forward all emails from your support email address, for example support@mail.com, to the address available in the Email section.